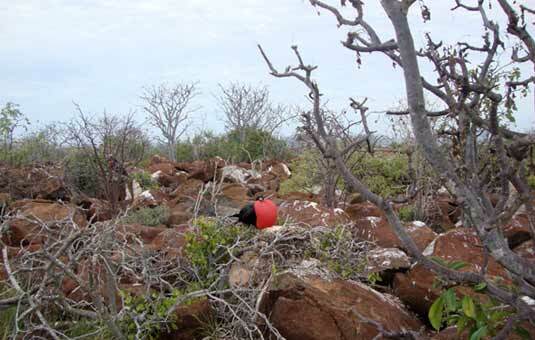 Galapagos sea lions, blue-footed boobies and magnificent frigatebirds are abundant on North Seymour Island. The island was formed by a series of submarine lavas containing layers of sediment that were uplifted by tectonic activity. 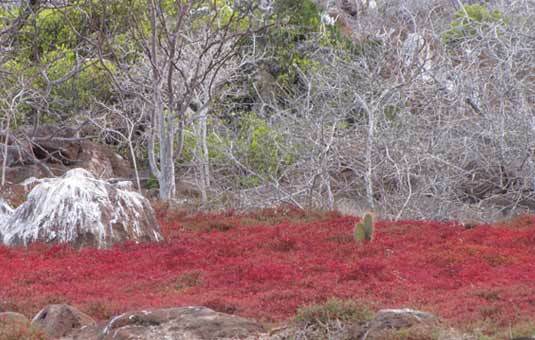 The island is characterized by its arid vegetation zone. Highlights: Land & marine iguanas, frigatebirds, blue-footed boobies, sea lions; snorkeling: rays, reef sharks, fish, garden eels. Activities: Dinghy ride & hiking (1.5 mi/2.5 km) and/or snorkelling. Low, flat and rocky, North Seymour Island seems unimpressive from the panga taking visitors from the ship to the shore where the hike will begin. Never fear: this boulder-strewn island has a lot to offer. The landing can be a little challenging when the water is rough, but once you're on land you'll be greeted immediately by a colony of snoozing sea lions who may blink up at you a few times before returning to dreaming of fat, slow-moving fish. The trail on North Seymour is a circular one, going along a picturesque shore before heading into the interior of the island and then returning to the spot where the pangas land. Along the shore, you can expect to see more sea lions. Keep your eyes on the water beyond the crashing surf: sea turtles sometimes feed offshore and if you're lucky you'll catch a glimpse of one surfacing for air. North Seymour is known for a large colony of Magnificent Frigatebirds. 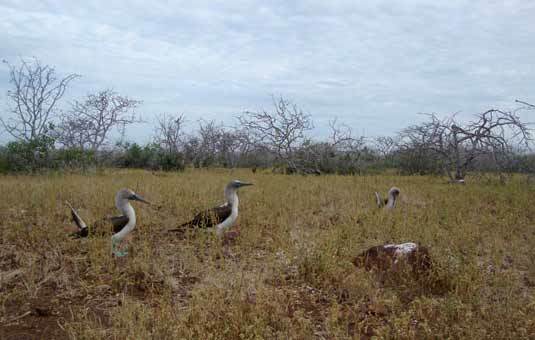 There are two species of frigate in Galapagos: Great Frigatebird and Magnificent Frigatebird. The two species are difficult to tell apart, but if you're interested, you guide can point out a couple of ways to distinguish them. A relative of the pelican, Galapagos Frigatebirds of both varieties are known for the large red inflatable sac on their breast. Male frigates can inflate this bright, kidney-shaped sac for the purpose of attracting a mate. Some of the birds nest quite close to the trail and if you're lucky you can get a good photo of one. Often, you can see downy white frigate chicks in one or more of the nests. Frigates are called "pirates of the air" because of their feeding habits. They don't have waterproof feathers and therefore cannot dive for fish like boobies do. Most of their food is snatched off of the surface, such as surface-feeding fish and small turtles. However, they have been known to harass boobies and other sea birds into dropping their catch, which they then take for themselves. If you're lucky, you may get the change to see a frigate "mugging" a hapless booby as they fly overhead. As the trail curves into the interior of the island, it wends its way through scrubby trees and around dusty brown boulders. Keep your gaze low: both to avoid twisting your ankle and to look for land iguanas. 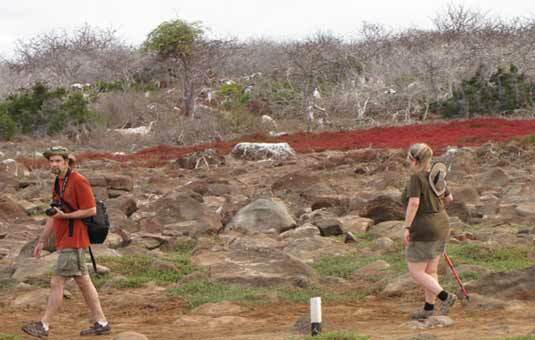 The island has a large and healthy population of land iguanas. Look for them gnawing bits of cactus, one of their favorite foods. They tend to blend into their surroundings, so keep your eyes peeled! There is an interesting story concerning the North Seymour land iguanas. In the early 1930's, visiting tycoon and amateur naturalist Allan Hancock noticed that North Seymour Island did not have any land iguanas, so he moved some over from neighboring Baltra. The iguanas flourished, in part because North Seymour plants had yet to evolve natural defenses against this new arrival. By the mid 1950's, the Baltra Island land iguanas had gone extinct, in part due to hunting by US soldiers stationed there during World War Two. The iguanas were reintroduced to Baltra successfully and today both islands are home to thriving iguana populations. North Seymour is also home to Swallow-tailed gulls, Galapagos doves, marine iguanas, blue-footed boobies, mockingbirds and Darwin's finches.